The Competition is divided into two categories (Primary and Secondary) and the participant enters the Competition on an individual basis. Fill in the application form and upload the entry in https://edcity.hk/r/healthynetcomic. 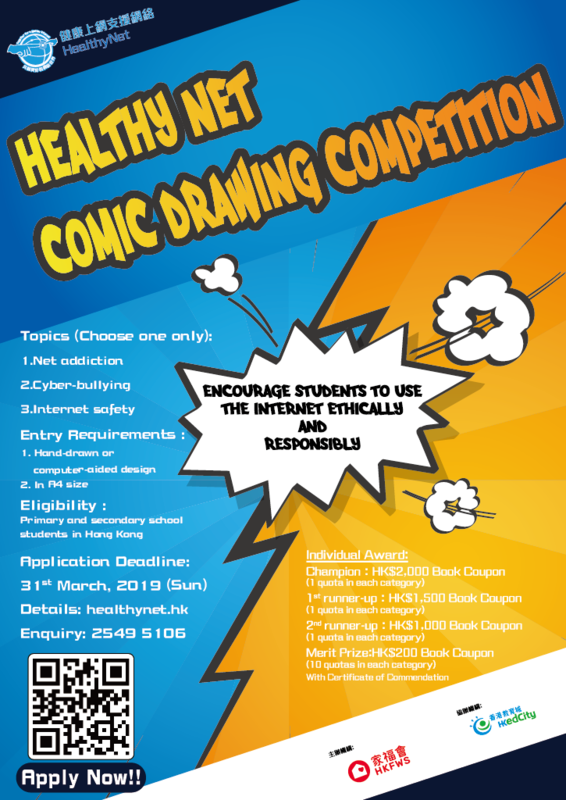 Send the entry with application form by mail to our office, address: Western Garden, 80A, First street, Sai Ying Pun, Hong Kong (Attn: Healthy Net Comic Drawing Competition). Final result will be announced in https://healthynet.hk/ in May 2019. Winners will receive phone and email confirmation of Prize Presentation Ceremony arrangement. Winners should confirm the attendance of ceremony within 2 weeks upon notification. Preliminary selection of the entries will be conducted by the organizer and the judging panel will further select the champion, 1st runner-up, 2nd runner-up and merit prize according to judging criteria. Most Active School in Participation Award will be awarded to the school with the highest number of participants. The decision of the Judging panel will be sole and final. Please contact Ms. Sylvia Luo or Ms. Karen Wong at 2549 5106. All entries must match with the topic of the Competition and present in comics. Either Chinese or English text can be included for strengthening the presentation. All entries must be the participants’ original work. Participants must ensure that their works will not infringe the intellectual property rights of any other persons. All entries have never been published before or submitted to other competitions. Both hand-drawn and computer-aided designs are acceptable (black and white or color). For hand-drawn entries, there is no restriction on the painting tools used. The comics must be drawn on a piece of A4-size white paper. All entries must be scanned in JPEG or PNG format of less than 100MB in size for online submission. 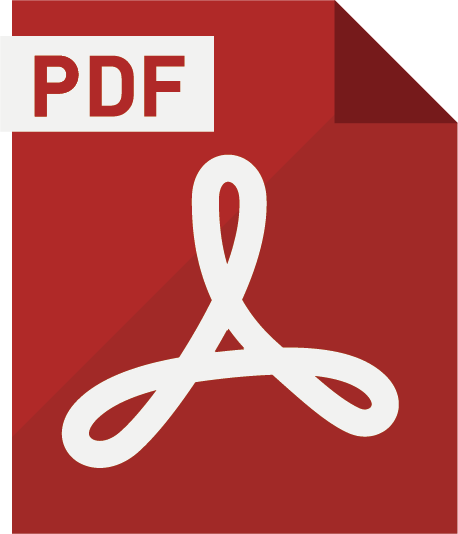 For computer-aided entries, files must be submitted in JPEG or PNG format of less than 100MB in size. The participant must submit the application form including participant information, name of the entry and a brief description of not more than 100 words to describe the entry. All entries should not infringe or violate, or involve elements that infringe or violate applicable law and regulations. All entries must be original work and does not infringe the rights of any other persons (including but not limited to intellectual property rights). Entries have never been published or displayed in any media, in public or in other competitions. Also, the entries cannot be used in other similar competition before the end of this competition. Otherwise, entries will be disqualified. The copyrights of entries would be owned by the organizer after submission. The organizer has rights to edit and use any part of the works in any media for publicity, promotion and exhibition purposes, including but not limited to online media, publication, printed matter, video and multimedia production without royalty payment and notification to the winners. Personal information, including name and school etc., should be filled in the application form. It is the responsibility of the participants to ensure that the information given is valid and complete. The organizer has the right to disqualify participants whom are found to have violated the rules and regulations without further notice. Winners could not attend Prize Presentation Ceremony should redeem the prize at Hong Kong Family Welfare Society, Hong Kong Western Centre within 3 months upon the announcement of the result. Late redemption would not be entertained without further notice. Participants must clearly understand the Competition Rules and Regulations, submission of an entry shall be deemed to have agreed to and accepted the rules and conditions of the competition. The organizer reserves the rights to interpret and amend the rules and conditions of the competition without prior notification to the participants. Decision of the organizer shall be final. For the sake of fairness, employees and immediate family members of organizer, co-organizer, Judging panel and any other staffs in relation to this Competition will not be eligible to participate. The personal data provided by participants and relevant persons will be used for the purpose of application, contact, survey, results announcement and any arrangements related to this activity /scheme. For the above purpose, name and school name/organisation name of participants and relevant persons may be disclosed through organizer and co-organizer’s website and/or other websites and/or media. It is mandatory for participants to provide personal data in the application form. If participants do not provide such personal data, organizer and co-organizer may not be able to accept the application. It is voluntary for participants to provide personal information, it will help organizer and co-organizer to gather statistics and review its service quality. When go through links out of Hong Kong Family Welfare Society such act would mean that you have already left the website of Hong Kong Family Welfare Society. The organizer and co-organizer are not liable to or responsible for any security and data protection issues arisen.